The Business and Commercial Services (BCS) Division provides a wide range of services to individuals and companies who conduct business within Arkansas, whether they’re based inside the state or elsewhere. The BCS division combines several departments under one convenient umbrella to streamline customer service. BCS is Arkansas’s starting point for people wishing to transact business in the state. Consumers can search for an available name for their company as well as file appropriate documents for their business. BCS also records trademarks, files notary public certifications, issues Authentication of Documents and Apostilles, and records Uniform Commercial Code Filings. For more information, you may visit the BCS office in the Victory Building at 1401 W. Capitol Avenue, Suite 250 in Little Rock, by phone at 888-233-0325 or 501-682-3409 or by email at corprequest@sos.arkansas.gov. If you question is concerning UCC filings please email us at ucc@sos.arkansas.gov. The Business Office includes Purchasing, Supply and Mail sections. 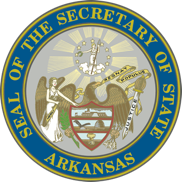 The Business Office is also responsible for arranging insurance coverage for the Capitol and other buildings along with their contents that fall under the Secretary of State’s jurisdiction, and for purchasing, inventory and disbursement of Arkansas and United States flags as authorized by law. Contact the Business Office by visiting Room 12 at the Capitol, calling 501-682-8032 or by email at business@sos.arkansas.gov. The Capitol Facilities Division cares for the almost century-old State Capitol and its surrounding landscape. A variety of skilled people maintain and preserve the Capitol itself, as well as the Capitol Hill Building and features around the Capitol. Housekeeping staff attend each of the offices located in the building, while Capitol Grounds Staff nurtures the 51 varieties of roses found in the Capitol gardens. For more information on this department, call 501-682-6244. The Communications and Education Division familiarizes the young and young-at-heart about elections, the State Capitol, Arkansas history and citizenship. This information is provided through a variety of formats, from websites, events and publications to guided tours, exhibits and travelling presentations. The department coordinates programs such as Young Voters Workshops and teacher in-service workshops, as well as quarterly exhibits at the Capitol that showcase Arkansas-related themes. Communications & Education staff support the Secretary of State’s other divisions through creative services such as photography, print production and event planning. Major programs of the department include voter outreach campaigns, civics education materials and the Capitol Lighting Ceremony held each December. The office also archives the architectural drawings of the Capitol and other historical documents. To schedule a Capitol tour, contact Visitor Services at 501-682-5080. To schedule an event at the Capitol, contact the Events Coordinator at 501-682-3042 or by email at capitolevents@sos.arkansas.gov. Contact the department by calling 501-683-3013 or by email at arsos@sos.arkansas.gov. The Elections Division speaks to the very heart of our democratic government through the services they offer to citizens. In addition to maintaining the state’s election records, the department assists county officials with conducting federal, state and district elections. Helping to ensure compliance with federal election laws such as the National Voter Registration Act and the Help America Vote Act, the division plays a central role in establishing and maintaining Arkansas’s uniform statewide voter registration system and continues to help oversee training on the state’s electronic voting systems. The Elections Division serves as a clearinghouse for campaign finance reports that are filed with the Arkansas Ethics Commission. The library of the Elections Division maintains the journals and acts of the Legislature along with all incorporations and annexations of cities and towns. Contact this department by visiting Room 026 at the Capitol, calling 501-682-5070 or toll free at 800-482-1127 or email at electionsemail@sos.arkansas.gov. The Human Resources office coordinates the areas of staffing, recruitment, training, compensation, payroll, benefits and personnel management for the Secretary of State’s office. Visit our Employment page for current job opportunities and to download an application. Contact the Human Resources office, Room 03, Little Rock, AR 72201 or by calling 501-683-5487. The State Capitol Gift Shop is located on the first floor of the Capitol. Offering Arkansas made products, the Gift Shop is open Monday through Friday from 9:00 a.m. until 4:00 p.m.
For more information call 501-682-3593. State Capitol Police provide security for the State Capitol building and police services for the Capitol Complex. The Capitol Police Desk is located on the first floor in the Capitol. Please call 501-682-5173 for more information about this department.